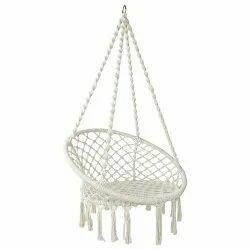 Our product range includes a wide range of crochet hammock, macrame swing and garden tray. The Crochet hammock is made from high grade cotton fabric. 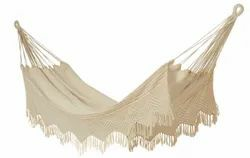 This is a traditional South-American hammock coupled with great craftsmanship. Made from power loom fabric, comes in a coordinated fabric bag. This is perfect for your patio or garden, the interior of your house, for terraces, balconies, and the beach. The crochet is hand-made and can be done to any suitable design and colours. Packaging Details: Can be customised according to buyer's requirement. Lay back and relax as you enjoy this roomy, soft and extra-comfortable hammock swing chair. This is an extension to the crochet family. Available in various designs and can be customised to your taste! This solid natural off white color chair is an elegant blissful retreat that matches any decor. The beautiful artisan made macrame – crochet fringe makes this a conversation piece and can be used indoors and outdoors. The elegant appearance and pure cotton construction will quickly make this your favorite seat, hand-crafted, tightly-woven, and purely luxurious. The Garden Tray is a beautiful addition for the Patio and Garden! This is powder coated in silver colour giving it a sheen and a long-lasting life. This takes seconds to setup and very easy to use. This comes compactly packed and a perfect pairing with your hammocks and swings. Looking for Crochet & Macrame Hammocks ?